As most of you all should know by now, I have taken over the roll of Head Producer / Music Director of the Veteran Art Center, and also the newest Board Member. Currently, the music room is closed undergoing a lot of upgrades. Due to the modifications, the music department has been completely closed off for private or open use. The tentative reopening was supposed to be 25MAR2019. Due to some delays experienced, the time frame has shifted to the right a little bit. I am hoping to get everything completed and ready for use by mid-week instead. 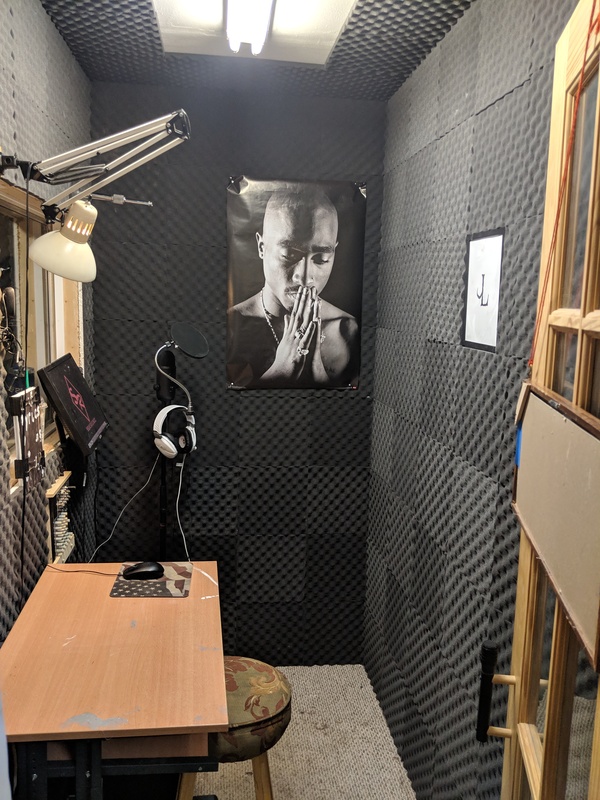 The old music director office has been re-formed into a fully functioning recording booth for people that wish to record vocals. Soundproofing material has been attached to all walls and ceiling making the noise reverb in the room to not be an issue, as well as the noise from outside sources to be dampened, although there is no way to completely eliminate all exterior noise. 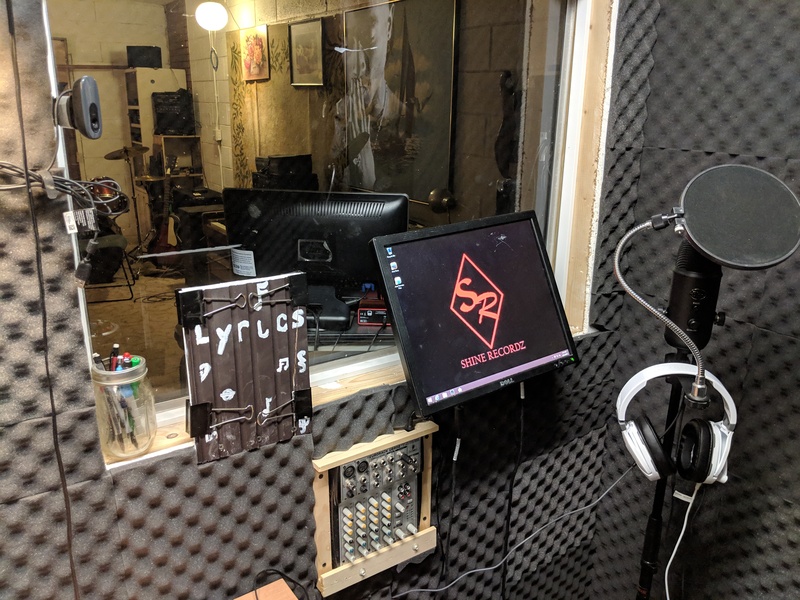 Computer programs that allow for digital vocal recording, wall mounted monitor for allowing reading of lyrics that you may have typed up or use the wall mounted paper holder, wall mounted microphone made for studio quality voice recording, wall mounted crossover interface. Wall mounted webcam so that you can record yourself in the booth so that you can post it to social media, or keep the file for your own personal collection. The window between the music room and the recording booth allows for anyone that you have with you, or myself if you so choose can see each other which helps with the recording-producing process. Lighting in the booth can be bright, or for those with performance anxiety (or even if you just prefer) you can simply use either the lamp or just the computer monitor for illumination. With having an extensive and lengthy background in recording and producing music, I will be able to teach members how to record their vocals digitally, create beats using beat making software, mix your new digitally recorded vocals and beats, record yourself playing your favorite instruments so that if you choose to, you can then record yourself singing to your own instrumental. By having the ability to have an on-location guide to step you through the editing process, you can take your music to a whole new level. 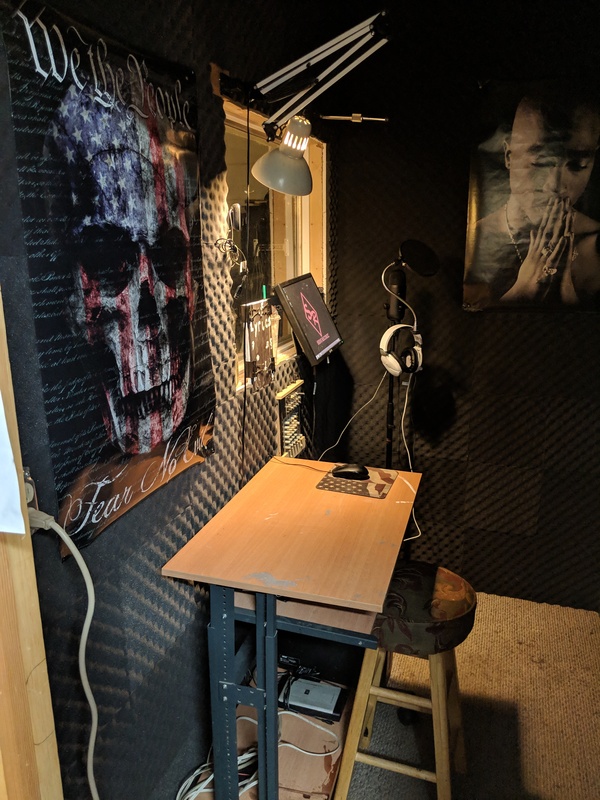 You can now be in the recording booth recording your vocals with either me, or someone you are with listening on headphones to hear your vocals and music mixing together to ensure proper volume is taking place live so that the gain can be adjusted using the soundboard in the music room. If you would rather have professional production done on your music, vocal recording, album creation, etc. you can talk with me about your project and I can give you the available options that I am able to do for you (professional production fees apply with discounted rates for veterans). With more space in mind, the music room will be rearranged, and making the required cords, and equipment easier to find. Due to the security requirements of some of the equipment, some of the equipment may be locked up in a safe and made available upon request. The computer in the music room will also have the same ability to mix, edit, master, produce, and make beats. While making beats, you can either choose to create them using headphones or the speaker system so that all ranges can be heard. 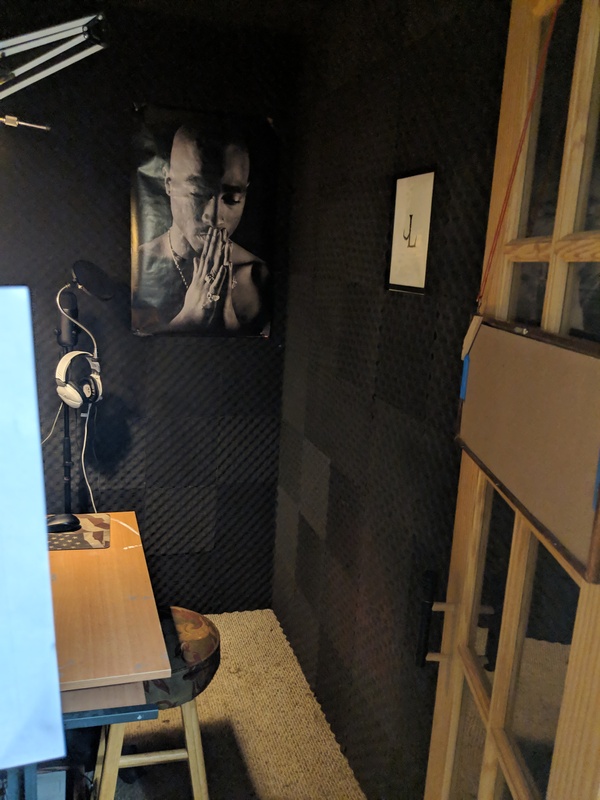 This room now also as described above, has the ability to hear the person recording in the booth along with the beat using the headphones that are linked through the wall. The main soundboard will be set up so that someone in the music room can adjust track levels, mic levels, compression rates, and all EQ components for those in the booth. All musical instruments now have the ability to be recorded digitally. You will have the ability to sign up to use the music room and/or recording booth without interruption. Due to the fact that the recording booth picks up noise from instruments that are being played in the music room, if anyone is signed up to record, the music room will also be booked for the same time and visa/versa. The only thing that anyone will be able to do while the other room is in use is using one of the two computers for beat creation, editing, mixing, mastering. If no one has scheduled for use of the music room, anyone may use the music room at the same time. If someone has started to record in the booth, and is not booked on the schedule, the music room will be closed out of respect and courtesy of the person recording. If someone is scheduled to use the music room and you are using the recording booth, you must stop recording when their booked time starts and may resume once their scheduled time is over. If anyone is scheduled to use either the recording booth and/or the music room and they are not there, you may use either room until they get there but must vacate once they arrive, even if they only have 10 minutes left of their requested time, then they will have 10 minutes of uninterrupted time. 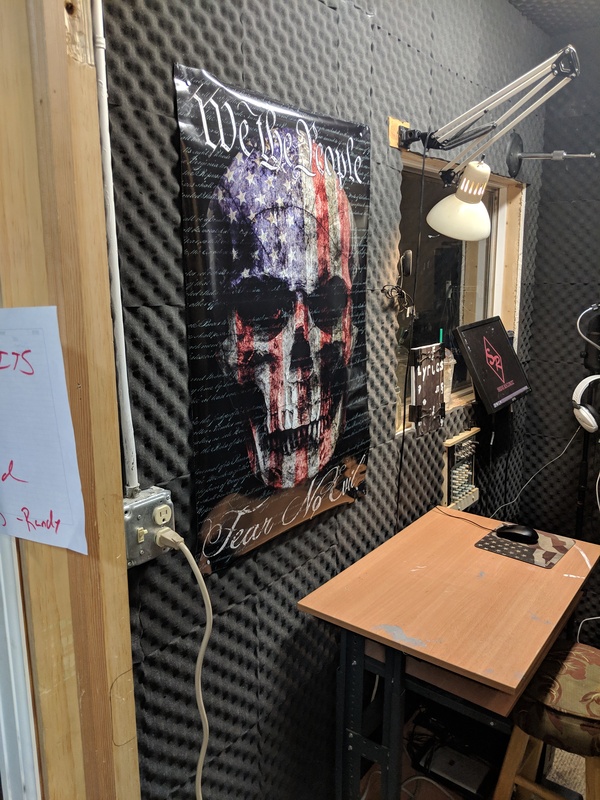 Because of some of the damage, loss, theft, abuse, negligence, and lack of consideration of other members, anyone who wishes to utilize the music room and/or recording booth must read the music department rules and sign an agreement form stating that you will adhere to all the rules. This will ensure that the equipment not only is made available to members to use, but will also ensure that the equipment is in working condition. When you are done, you will be expected to put any and all equipment away where you got it from, return all nobs to 0, power down any equipment you turned on, and turn off the light as you leave the room. More updates to come, these are the plans and the upgrades made to the music department as of now. If you have any ideas on how to make the department even better, questions, recommendations for either changes in policy or rules please let me know either on this thread, in person, or email me at JekylOfficialMuzic@gmail.com Updated pictures will be uploaded into the Music Department portfolio, as will member's photos using the equipment and/or rooms if the members request them to be posted or give authorization for them to be published. My hours are Monday - Friday from 0900 - 1500. The only reason I will not be available during these times is if I have an appointment, sick, or out of the building doing something else for the Art Center.